Hip Hops: POS Recovered & Intact! As I drove down the road, 20 neighborhood kids started chasing after my car, clapping & cheering. I felt like a triumphant soldier returning from war. Only a few days before, these 20 kids went out in search of my missing car. I don't think they made it more than .2 miles away. It was only 20 kids, but still louder than some Wizards games last season. The case of the Missing Buick has been solved, and Encyclopedia Brown didn't even need to be called in. Just 2 days after the heist of the century, my car was found 2 miles from my house in a random neighborhood! No Damage, Took my cheapo discman, & my bat & glove for softball. Here is the Dagger! Keys in the ignition! Whoops I guess there was a spare key in my car somewhere under all the trash. Apparently when my car is parked in front of a house, it immediately causes suspicion. The FBI agent who lived where the car was parked, noticed the vehicle, saw the windows down, and called the police! Woohoo. I may never have found it, thanks robbers! So who took it? I don't want to sound ageist but...DAMN KIDS! Joyride? I assure you, there is no joy in driving it. What have I learned from this whole thing? That people will steal any car. There is no escape. I feel bad for people with real cars. Beware! Also, don't leave keys in a car! 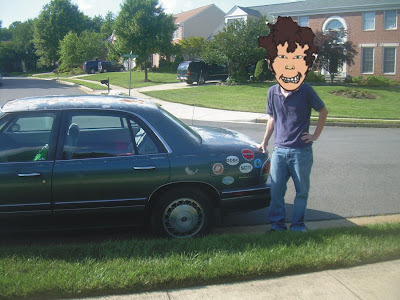 I also learned that I need an updated photo of my car so next time it gets stolen I can prove to people that they will recognize it! Possibly the best part was the Police Officer thinking that the robbers trashed my car. Actually officer, that trash was already there, and those clothes were all over the floor & seats when they took it. Best part is that all of those 20 kids will leave home before you do.